Are IPOs slowly making a comeback? For someone who started out thinking he’d be a professional drummer, Alan Arnold has carved an enviable niche for himself in the tech world. As CTO, Alan has led Vision Solutions in his own direct style, partnering with some of the top people in the business. The Sterling Report chats with Alan to find out more about his hobbies and his thoughts on the current economic downturn. The Sterling Report (TSR): Was a career in the tech world part of the game plan for you at an early age? Alan Arnold (AA): I thought I would be a professional drummer, and as I got to college, I realized that being a good musician didn’t mean you could make a living at it. I had to find something else to do as well. My father is a career IT professional and he suggested I try technology; so I did. After my first couple of classes I was hooked and never thought of doing anything else. TSR: Who were your most important mentors? What were the most valuable lessons they imparted to you? AA: My first important mentor was Jerry Peterson. Jerry was one of the founders of a company that I was a part of right out of college called Specialty Insurance Services. I traveled all over the United States with Jerry and learned that technology was only part of the solution. I needed to work hard to understand the business problems I was trying to solve and apply the technology to the problem. Many technologists get that point reversed and try and apply cool technology to what they believe is a problem that needs to be solved realizing later the old way was just fine. The dot com companies have many examples of that issue and I am glad I learned it early in my career. Jerry also taught me the meaning of working hard and staying focused on goals, and being part of a start-up company also helped me define my work ethic. Today, one of my most important mentors is Jerry Thode who I worked with at Ernst & Young LLP. Jerry’s breadth of technology and business knowledge always reminds me to continue to work hard to learn new ways of doing things. I enjoy meeting with him and getting his perspective on challenges I face running a global technology company. I would also say that I have been blessed by having worked with many great technology professionals over the years and have learned something from almost every person I’ve ever met. AA: My style is one of direct communications. I believe my strength is one of seeing the bigger picture and thinking differently than others on how to solve issues. I have always surrounded myself with really bright people, and that challenges me to be on top of my game and keeping my managers focused on our objectives. I try to inspire my managers as their leader, and be very specific on my expectations as their manager so that there are ‘no surprises’ from anyone. TSR: What are your concerns about the current recession in the US? How do you think it will affect Vision Solutions’ long-term plans? AA: I typically look at economic issues on a global perspective more than just a US perspective since Vision has customers on every major continent. I can only hope that the world’s economic engines recover soon because the more business our customers do, the better it is for Vision since we are in business to help them optimize and protect their critical business data. TSR: Tell us about some of the toughest leadership decisions you have had to make in a market that is as unstable as this one. AA: Because of the current market economics, we have had to right-size our business like everyone else. The Vision team has many passionate and bright people within its organization. Letting anyone go is never any fun, and it’s especially difficult when you know the person has a family, a mortgage and a life that your decisions will be impacting. It’s probably the worst part of management and something that unfortunately we all learn to deal with. The senior management team at Vision really cares about our employees, and as we were required to adjust with the economy, we have tried to go beyond what was ‘just required’ and do what was right for those affected. TSR: What are the most exciting new projects at Vision right now? AA: We have some great initiatives under way right now at Vision. The first one I am really excited about is the integration of our products with our backend Vision systems. It’s really Vision’s first steps towards our ‘cloud’ computing initiative to allow our customers and partners to service themselves. Many of the manual processes we had in place in the past are being updated to allow customers to get automatic license keys, to do self-service on product questions, etc. The second big initiative is taking many of the top features we have acquired and putting those features in our other products. This is great because it will give our customers access to solutions and processes improvements that no one in the industry is doing today. Our current and future customers will benefit greatly from this. TSR: Having participated in mergers and acquisitions, as well as held out against a hostile bid, what, in your opinion, is the toughest aspect of acquiring another company? AA: I have become an expert in this area and most of the experience has come from my actual M&A work. I merged four technology companies together in three years and my biggest lesson learned is understanding the culture of the company you are acquiring. Changing a culture is very, very difficult, and for most employees, there is not as big a financial incentive for them to want to change as the more senior employees or management team. As soon as rumors start of acquisitions, positioning starts with managers and employees. It can be very disruptive and distract your teams from doing their core jobs and taking care of our customers. What I am most proud of is the fact that Vision was able to do these acquisitions without it affecting our customers. Three of the four companies brought together were also fierce competitors in the market, and that dynamic of the mergers should not be underestimated because it required an additional level of building trust between the management teams. Fighting off the hostile bid was completely different than M&A work. My focus during that time was keeping our employees focused, our senior management team believing in our mission and working closely with our board and outside investors. The board of Vision and the senior management team had no issue with being acquired, but the valuation that was put on our company was low and would not have given a fair return to our investors, thus we fought hard as a management team to not be acquired. In the end, we made out very well, and I believe that set us up for growing Vision to the company it is today. TSR: After buying up competitors, companies own multiple and disparate product lines. How has Vision navigated the management of those products? AA: I brought together a team of the smartest and brightest at Vision and over a three-month process evaluated the strengths and weaknesses in each of our products. Based on this information, I created the product road map and worked with our senior management team and market group to put together our strategy related to our products. Market segmentation was as important to us the mix of our products. We found that some of the products we acquired fit very well in the Small Medium Business (SMB) market, while other products fit much better in enterprise class accounts. If we had product overlap in a market segment, we looked at how many customers were using the products and made decisions to merge key product features into one product or simply to discontinue a product and replace it with another. These decisions are not always easy, and when you are dealing with a development team that has been working on a product for many years, the decision to shut the product down is a very emotional discussion. Most people get over this after they get busy on their next project, but there is typically some work to do on the “buy-in” process. I also believe that our Marketing Team has done a nice job in delivering an easy to understand product portfolio to our customers and market. TSR: How has Vision’s product profile changed after you entered into a partnership with IBM? AA: Vision is one of IBM’s top solution providers in the world. I believe we are still the only High Availability/Resiliency Premier Business Partner IBM has in the world. Because of the nature of our business, we drive an estimated $300M of hardware a year for IBM and our business partners. This is a significant amount of Power Systems Servers and that allows us to have a great relationship with the IBM executive team and the development labs that we do joint development with. I work with some of the top experts in the resiliency field at IBM and it’s a very nice partnership we have. TSR: You have many publications to your name. What made you want to get involved with writing? AA: Writing for me was a form of research in to subject areas. I would start doing research and that would typically lead me into some type of collaborative relationship with other professionals in the industry. Most of the topics I wrote about were not being covered and it made sense to write a book about the subject. In the earlier days of my career as a consultant, it was easier to leave a book with my clients to explain the topics I was working with them on than to write a custom deliverable for each of them. I was also lucky to work with some great publishers that make the writing process much easier. TSR: What is your favorite part of the job? And what part of your job do you like the least? AA: My favorite part of my job is traveling around the world giving speeches and meeting with customers. It is really rewarding to hear about how Vision’s products are being used in the biggest companies in the world today. Talking about issues and related solutions is rewarding in many ways. I have been able to do more of this recently because of the great management team I have been able to put together. They take care of most of the day-to-day activities for me. My least favorite is harder to identify. It’s probably the same thing most senior management people don’t like dealing with and that’s human resource issues, but that comes with the territory. TSR: Tell us about how you have evolved professionally. If you were to compare yourself today to the Alan Arnold from 15 years ago, what would the differences be in terms of your approach to leadership and management? AA: My biggest difference from 15 years ago is allowing my experience to work for me. I have seen a lot of change over my years in the technology industry. I work hard to keep my technology knowledge up to date, but I work as hard to keep my business and process skills current. As I have managed larger and larger organizations, you learn how to pull from multiple sources of information to make decisions for the business. I have also become a better communicator, both down to my managers, and up to our CEO and Board of Directors. Too much or to little communications will get you in trouble. I have also learned that I need to be careful as I design commercial software because you don’t always need to use leading-edge technology right out of the gate. Sometimes letting technology mature is a better business decision, despite having hundreds of programmers telling you to move all of your development to a newer development language (so they can update their resumes). It’s better to watch and understand the trends, and then make the right business decision. TSR: What are your hobbies? How do you find time to relax from work? AA: My favorite way to relax away from work is traveling with my family. We have traveled all over the world together and I really like the fact that my kids are growing up with a global perspective on life. My personal hobby is playing the drums and recording. I actually have a recording studio in my home and enjoy composing and playing music. 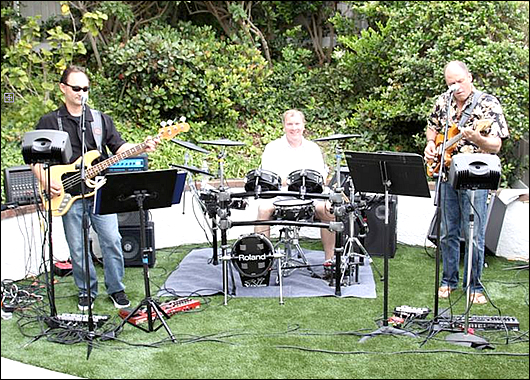 I have a band as well and we play charity events in the Southern California area. It’s a great way to relax and get your mind into someplace different. It’s amazing how many musicians there are in the technology world.